Video can help simplify the process of bringing on new staff at your organisation. It’s no secret that adding team members to an organization is an expensive proposition, not only as an investment but also during the recruiting and hiring process. Losing an employee early in their tenure when they’re finally beginning to add value can be devastating—proven by one recent study that shows companies most capable at onboarding practices are nearly twice as profitable as the least capable companies. This is why forward-thinking organizations place significant focus and resources on onboarding efforts as a way to positively affect both long-term retention, and of course, the company’s bottom line. With the risk involved in hiring new talent potentially offset by huge gains in profitability, organizations are striving to increase the consistency and efficiency of the onboarding process. All too often the term ‘onboarding’ is thought of as simply transferring knowledge about the company, the industry and the tools for the job. But an individual’s social integration is also key to the employee feeling accepted and able to express their individual identity. 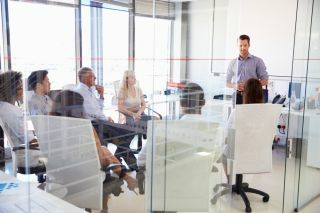 And onboarding is a critical first step to new recruits establishing their authentic, emotional connection to co-workers and the company. By Providing Information On Demand: Given the fire hose of information that hits a new recruit, the first few days of orientation can not only be overwhelming, but disengaging as well. Employees today can expect and appreciate the autonomy involved with learning at their own pace. Providing employees with a secure, comprehensive and easy-to-search video repository will empower individuals to quickly find, view or review exactly what they need, when they need it—and most importantly, when they are prepared to absorb it. By Bringing Information to the Devices They Use: Access to onboarding content from anywhere and any device is critical to large, distributed organizations, not just for the employee’s convenience, but for them to feel included and know they are valued too. An enterprise video platform will be important to make sure that access is completely equitable and seamless for everyone, from technicians using tablets or smart phones in the field, to customer support teams on virtual desktop devices. By Making It Personal: While in-person training is great, it’s not always possible—particularly within globally distributed organizations. Through both live and on-demand video, internal communicators, HR staffers and trainers can share authentic, engaging knowledge with new employees. And more than ever, it’s easy and affordable to conduct large-scale sessions with streaming video engaging employees in globally distributed locations. By Keeping Them Engaged: If you’ve ever taken part in a webcast in which no one asked any questions, you know the value of interaction. Interactivity can easily be built into video-based onboarding content with quizzes, comments, polls and sharing on social business platforms. And even watching a recording of a live session gives the employee the opportunity to hear their colleagues asking the same questions they would, rather than simply listening to a talking head. By Facilitating Peer-to-Peer Support: Onboarding may start with the Human Resources department, but it is maintained and ultimately sustained by an employee’s peers. Employee-generated video content from peer contributors can be invaluable for training related to departmental-specific systems, processes and policies, and can help create bonds among both co-located and distributed teams. 1. Strategy, straight from the CEO: A video recording of your organization’s most recent Town Hall meeting—or better yet a new employee welcome message from the CEO—is the perfect asset to connect new employees with the company’s mission and goals. 2. The On-the-Job Description: In place of a written job description, have a few team members record their thoughts on the most important elements of the new employee’s contribution, plus how they can be available to help. 3. A Departmental Overview: A video that expresses the roles and goals of their team or division will help leaders establish a consistent, core message that can easily be updated quarter-to-quarter or year-to-year. 4. Team Member Introductions: Help new employees get to know their team quickly with 30-second video introductions by each member that shows their personality plus something they’re proud of on the job and off. 5. Policies and Procedures: Use video to bring policies and procedures to life, providing examples and discussing practical applications or ‘what if’ scenarios to drive home the messages while saving HR staff time for more personalized work. 6. Community Involvement: A video about the company’s history, activities in the community and overall purpose can instill meaning, increasing engagement and the desire to be part of something bigger than themselves or even the organization. 7. Cultural Rules of the Road: A “Rules of the Road” video can really help a new employee get the short story on how the company culture works with various team members giving their take on anything from dress code to language standards to ways to socialize. 8. An Employee ‘Day in the Life’: Help new recruits visualize the job they’ll be doing, and the roles others play by recording “day in the life” videos of employees from around the organization and across departmental boundaries and distance barriers. 9. The Team in Action: Record your next Skype for Business session and show your new recruits what to expect of their first team meeting or show how a project unfolds from brainstorm to launch. Onboarding is much more than an administrative process, but rather a competitive advantage for your organization. Video can help unleash the energy and creativity of your newest team members.